A German cruise line has received a wave of backlash after its crew members shot and killed a polar bear that had attacked a guard whose job it was to spot and prevent interactions with the animal. The cruise, a Hapag-Lloyd ship called the MS Bremen, was traveling near the northernmost island of the Svalbard archipelago, between mainland Norway and the North Pole, had intended to show the bears off to a group of tourists — and it appears guards on the vessel attempted to scare the bear off before resorting to lethal force, officials said. Police spokesman Ole Jakob Malmo told the Associated Press that two members of the Bremen's 12-man crew that set out ahead of tourists on Saturday first tried to ward off the bear "by shouting and making loud noises as well as firing a signal pistol, but to no effect." In a statement, Hapag-Lloyd Cruises had said the attack happened when a four-person bear guard team, went on land ahead of the tour. "One of the guards was unexpectedly attacked by a polar bear that had not been spotted and he was unable to react himself. As the attempts of the other guards to evict the animal, unfortunately, were not successful, there had to be intervention for reasons of self-defense and to protect the life of the attacked person," the statement said. The guard who was injured is in stable condition, according to Hapag-Lloyd Cruises spokesman Moritz Krause. Experts warn that, as climate change continues to shrink the polar bear's habitat, the animals are finding themselves face-to-face with humans more often. "With climate change there’s a lot less sea ice and bears have to spend a lot more time on land. There is definitely more chance of interaction between people and bears," said Sybille Klenzendorf, senior biologist and senior species expert for the World Wildlife Fund. "And this is not just for tourism. This is for communities, this is for industry, anybody operating and living in the Arctic has this chance of higher encounters so we have to be prepared in a preventive and proactive manner to prevent conflict with polar bears," she noted. Experts told NBC News that in most cases guards have and are able to use a host of methods to deescalate bear encounters before resorting to killing the animal. "Deterrent methods are extremely successful," said Brian Horner, the founder and director of LTR Training Solutions in Anchorage, Alaska, which includes bear-guard instruction. Horner said there are several steps guards can take before killing the animal. A guard who sees a bear can first try to shoot a projectile firework that will cause a bang and scare the animal off, although this requires a precise shot in order to scare the bear backwards rather than forward. Guards also must take care not to start a fire with the flare, Horner said. Guards can also use a 12-gauge shotgun loaded with blank rounds. "All it does is make the shotgun make a really big bang. We like those, but our clients don’t like them because it's 161 decibels, and if you're not ready, you're going to have an ear ache," Horner said. The next line of defense is rubber bullets before a final non-lethal option: bean bag projectiles. But they can be risky. "When you're using bean bags, you're so close that if it decides it doesn’t like the bean bag, it's going to run toward you," Horner said of polar bears. 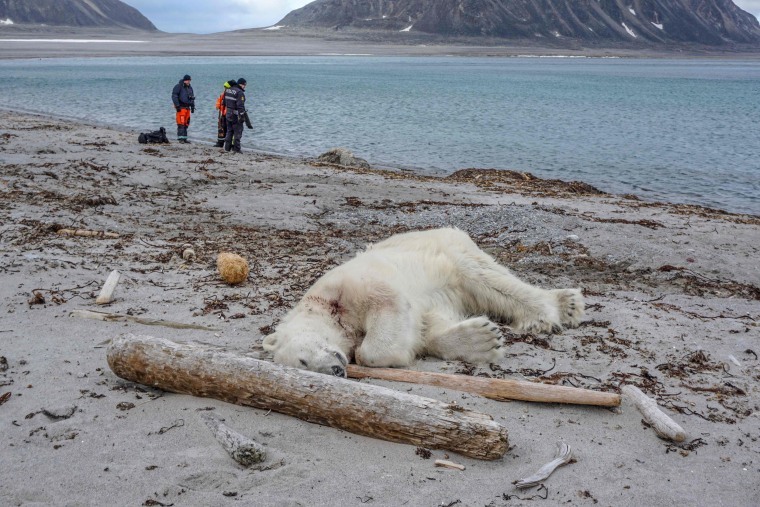 Klenzendorf said that there are specific rules of engagement that cruise lines are supposed to follow in the region where the killing happened over the weekend, and that polar bear guards are required to limit the chance of interaction between humans and bears. But even to the trained eye, in the Arctic, it's not an easy task. "It’s very hard sometimes in the arctic environment to actually see them," Klenzendorf said of polar bears. Horner agreed that it can be a challenge for bear guards to spot the animals. "Polar bears are smart. They’re really smart ... and they have to hunt a lot. Polar bears go from curious to interested quickly," Horner said, adding that "polar bears are sneaky" and likely crept up on the guards. Fortunately, Klenzendorf said, polar bear guards don't often end up having fatal interactions with the animals. "Given that it’s only been the second bear in 20 years of the cruising industry in Svalbard that has been killed, it shows there must be high standards that are being followed for interactions," she said.